Star Trek Prop, Costume & Auction Authority: Don Hillenbrand - The Wrath of an "angry, dishonorable bully"
Don Hillenbrand - The Wrath of an "angry, dishonorable bully"
1) Attacked the TOS Kirk tunic last year despite absolute screen matching and authentication by every major TOS expert in the country. 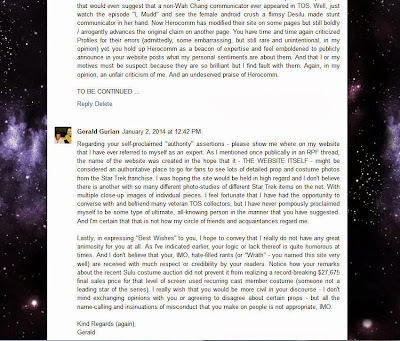 2) Attacked the TOS Phaser earlier this year despite a 100% screen match. And why does he attack items? Because he doesn't like the seller. He hates me, so he attacks my Kirk tunic, He hates Gerald, so he attacks Gerald's Phaser, and he hates Profiles, so he attacks them. There is no place for personal vendettas in prop authentication. Authentication is a scientific process. It is an emotionless one. I was the last person to actually believe the TOS Kirk tunic was really Shatner's, until I saw the screen match. And Don hasn't spoken to ONE expert on TOS costumes. He thinks he is an absolute expert, so he doesn't do any research with the people who have handled these costumes for decades. Although my first preference is to shy away from publicly admonishing fellow fans or collectors on this website; I feel it is appropriate to add my voice to that of Mr. Peters at this time. 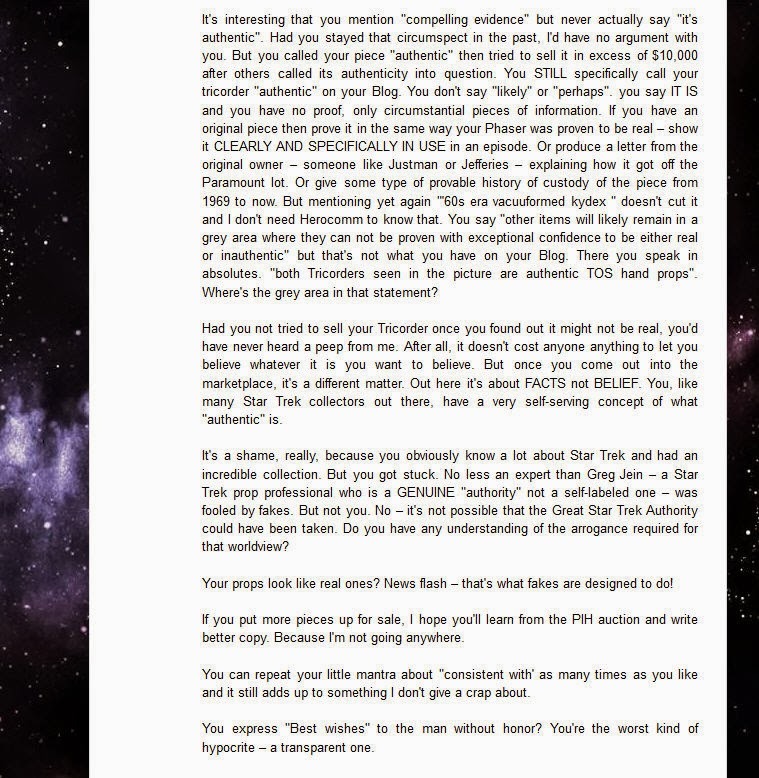 I have observed for over a year how Don Hillenbrand has, in my opinion, made a pastime of posting misleading and insulting information about many prominent collectors and memorabilia auction houses on his poor excuse for a Star Trek prop site called "The Wrath of Dhan". 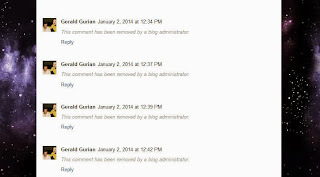 This Beacon of Free Thought promptly deleted all of my comments; presumably because he did not approve of the content. 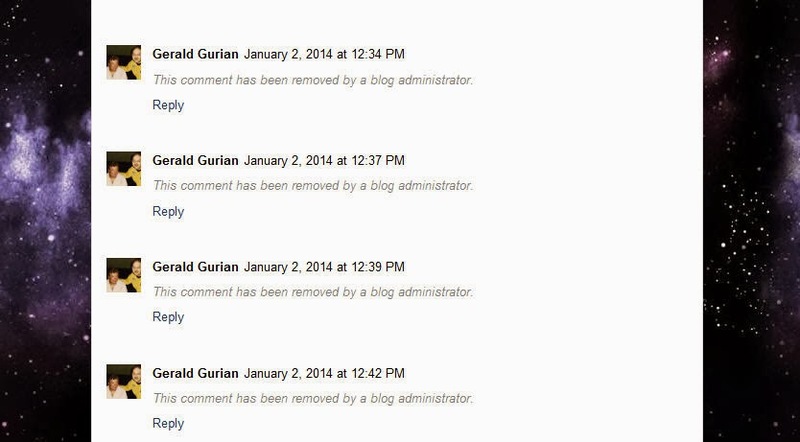 Of course, since it is his site, he has the ability to delete comments - but he shouldn't pretend he isn't silencing those that disagree in favor of promoting his own mistruths. 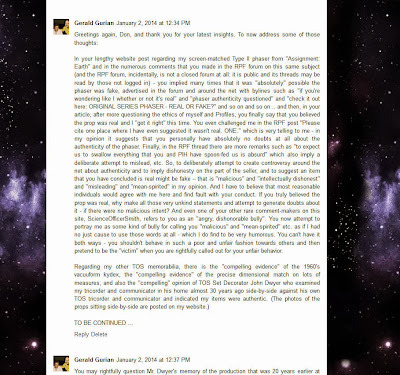 Here are the full set of original posts and my responses which, apparently, Don Hillenbrand does not want you to be able to see! 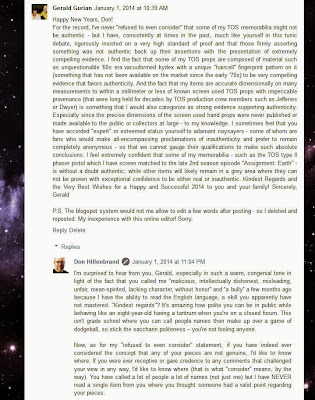 In your lengthy website post regarding my screen-matched Type II phaser from "Assignment: Earth" and in the numerous comments that you made in the RPF forum on this same subject (and the RPF forum, incidentally, is not a closed forum at all: it is public and its threads may be read by those not logged in) - you implied many times that it was "absolutely" possible the phaser was fake, advertised in the forum and around the net with bylines such as "if you're wondering like I whether or not it's real" and "phaser authenticity questioned" and "check it out here: ORIGINAL SERIES PHASER - REAL OR FAKE?" and so on and so on .. and then, in your article, after more questioning the ethics of myself and Profiles, you finally say that you believed the prop was real and I "got it right" this time. You even challenged me in the RPF post "Please cite one place where I have even suggested it wasn't real. ONE." which is very telling to me - in my opinion it suggests that you personally have absolutely no doubts at all about the authenticity of the phaser. Finally, in the RPF thread there are more remarks such as "to expect us to swallow everything that you and PIH have spoon-fed us is absurd" which also imply a deliberate attempt to mislead, etc. 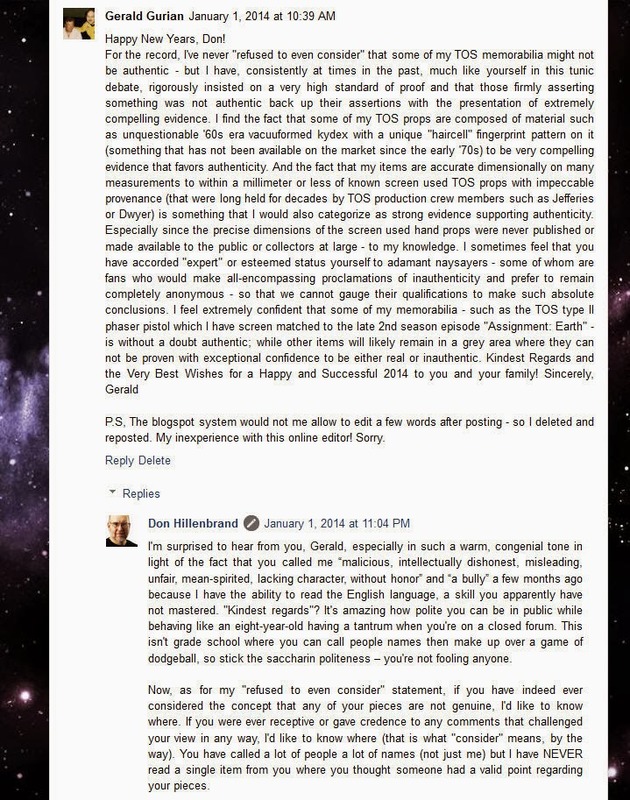 So, to deliberately attempt to create controversy around the net about authenticity and to imply dishonesty on the part of the seller, and to suggest an item that you have concluded is real might be fake -- that is "malicious" and "intellectually dishonest" and "misleading" and "mean-spirited" in my opinion. And I have to believe that most reasonable individuals would agree with me here and find fault with your conduct. If you truly believed the prop was real, why make all those very unkind statements and attempt to generate doubts about it - if there were no malicious intent? And even one of your other rare comment-makers on this site, ScienceOfficerSmith, refers to you as an "angry, dishonorable bully". 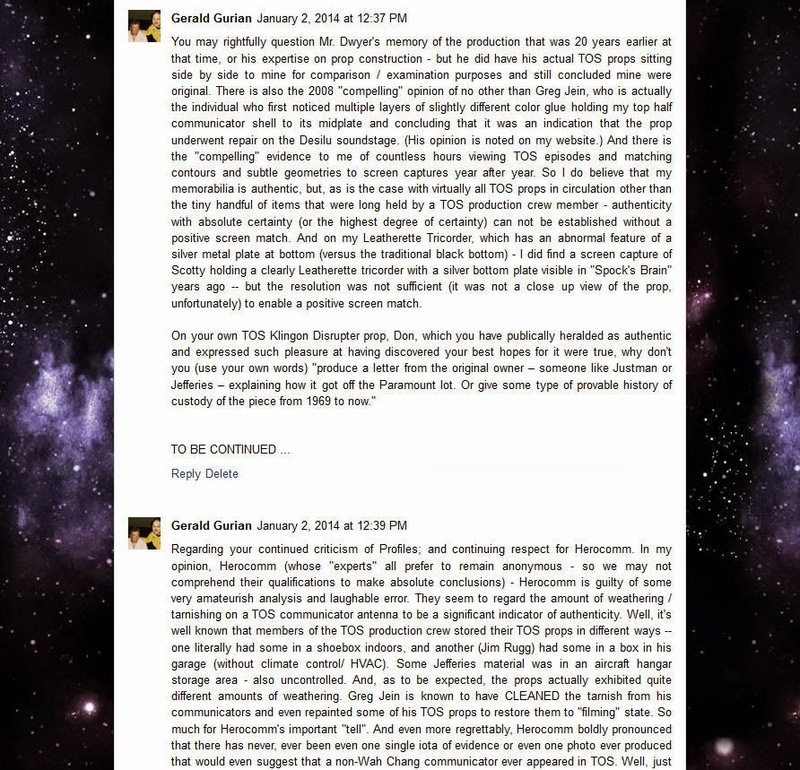 You now attempt to portray me as some kind of bully for calling you "malicious" and "mean-spirited" etc. as if I had no just cause to use those words at all - which I do find to be very humorous. You can't have it both ways - you shouldn't behave in such a poor and unfair fashion towards others and then pretend to be the "victim" when you are rightfully called out for your unfair behavior. Regarding my other TOS memorabilia, there is the "compelling evidence" of the 1960's vacuuform kydex, the "compelling evidence" of the precise dimensional match on lots of measures, and also the "compelling" opinion of TOS Set Decorator John Dwyer who examined my tricorder and communicator in his home almost 30 years ago side-by-side against his own TOS tricorder and communicator and indicated my items were authentic. (The photos of the props sitting side-by-side are posted on my website.) You may rightfully question Mr. Dwyer's memory of the production that was 20 years earlier at that time, or his expertise on prop construction - but he did have his actual TOS props sitting side by side to mine for comparison / examination purposes and still concluded mine were original. 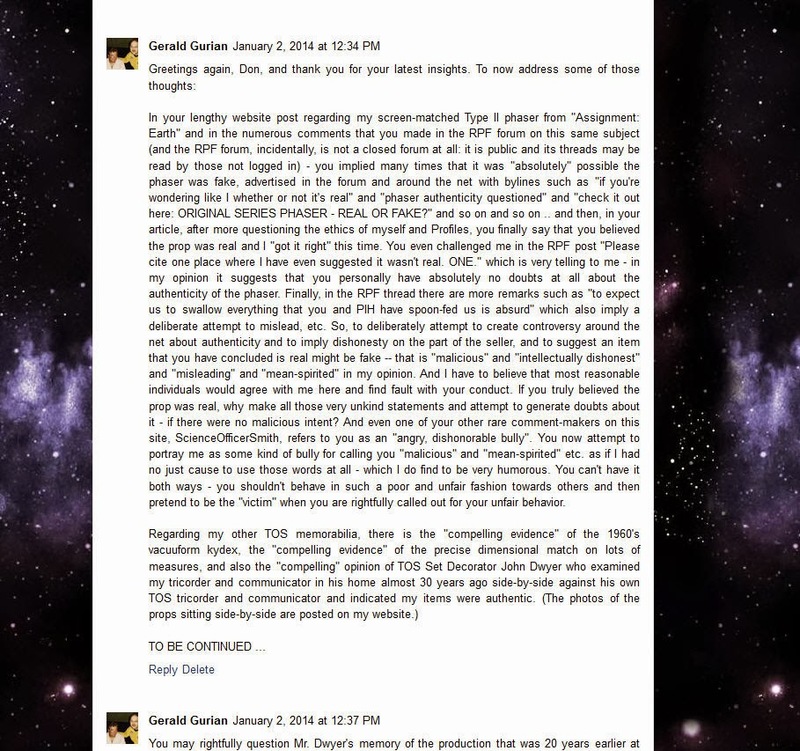 There is also the 2008 "compelling" opinion of no other than Greg Jein, who is actually the individual who first noticed multiple layers of slightly different color glue holding my top half communicator shell to its midplate and concluding that it was an indication that the prop underwent repair on the Desilu soundstage. (His opinion is noted on my website.) And there is the "compelling" evidence to me of countless hours viewing TOS episodes and matching contours and subtle geometries to screen captures year after year. So I do believe that my memorabilia is authentic, but, as is the case with virtually all TOS props in circulation other than the tiny handful of items that were long held by a TOS production crew member - authenticity with absolute certainty (or the highest degree of certainty) can not be established without a positive screen match. And on my Leatherette Tricorder, which has an abnormal feature of a silver metal plate at bottom (versus the traditional black bottom) - I did find a screen capture of Scotty holding a clearly Leatherette tricorder with a silver bottom plate visible in "Spock's Brain" years ago -- but the resolution was not sufficient (it was not a close up view of the prop, unfortunately) to enable a positive screen match. On your own TOS Klingon Disrupter prop, Don, which you have publically heralded as authentic and expressed such pleasure at having discovered your best hopes for it were true, why don't you (to use your own words) "produce a letter from the original owner – someone like Justman or Jefferies – explaining how it got off the Paramount lot. Or give some type of provable history of custody of the piece from 1969 to now." 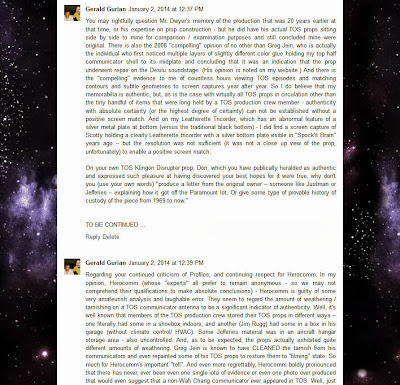 Regarding your continued criticism of Profiles; and continuing respect for Herocomm. In my opinion, Herocomm (whose "experts" all prefer to remain anonymous - so we may not comprehend their qualifications to make absolute conclusions) - Herocomm is guilty of some very amateurish analysis and laughable error. They seem to regard the amount of weathering / tarnishing on a TOS communicator antenna to be a significant indicator of authenticity. Well, it's well known that members of the TOS production crew stored their TOS props in different ways -- one literally had some in a shoebox indoors, and another (Jim Rugg) had some in a box in his garage (without climate control/ HVAC). Some Jefferies material was in an aircraft hangar storage area - also uncontrolled. And, as to be expected, the props actually exhibited quite different amounts of weathering. 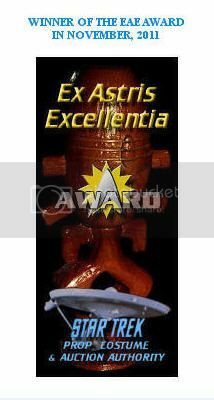 Greg Jein is known to have CLEANED the tarnish from his communicators and even repainted some of his TOS props to restore them to "filming" state. So much for Herocomm's important "tell". 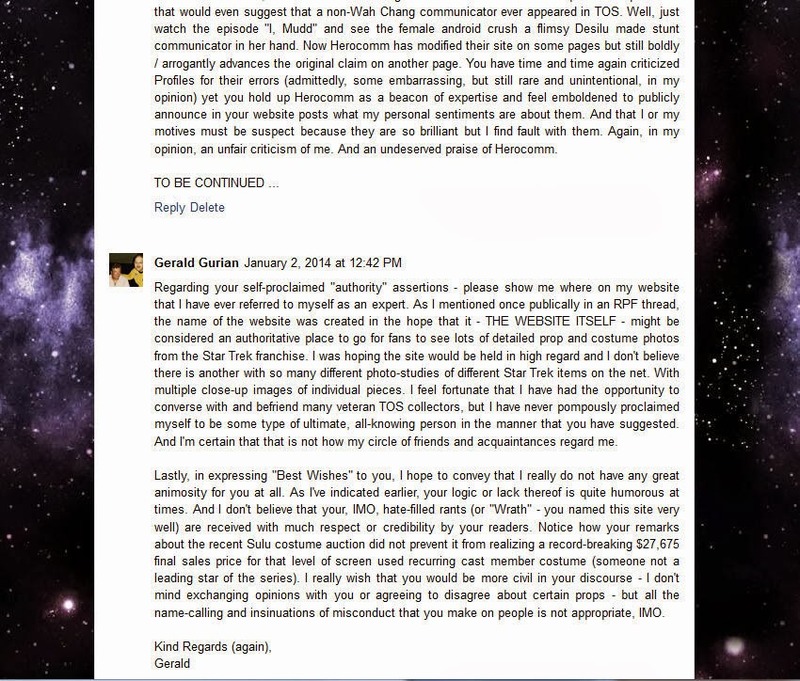 And even more regrettably, Herocomm boldly pronounced that there has never, ever been even one single iota of evidence or even one photo ever produced that would even suggest that a non-Wah Chang communicator ever appeared in TOS. Well, just watch the episode "I, Mudd" and see the female android crush a flimsy Desilu made stunt communicator in her hand. Now Herocomm has modified their site on some pages but still boldly / arrogantly advances the original claim on another page. You have time and time again criticized Profiles for their errors (admittedly, some embarrassing, but still rare and unintentional, in my opinion) yet you hold up Herocomm as a beacon of expertise and feel emboldened to publicly announce in your website posts what my personal sentiments are about them. And that I or my motives must be suspect because they are so brilliant but I find fault with them. Again, in my opinion, an unfair criticism of me. And an undeserved praise of Herocomm. Regarding your self-proclaimed "authority" assertions - please show me where on my website that I have ever referred to myself as an expert. 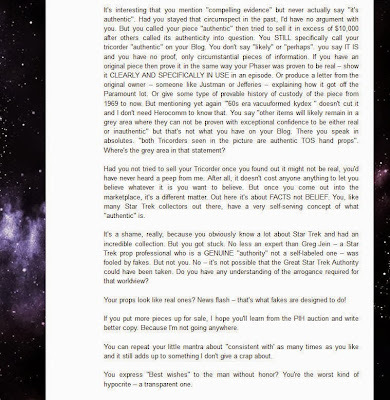 As I mentioned once publically in an RPF thread, the name of the website was created in the hope that it - THE WEBSITE ITSELF - might be considered an authoritative place to go for fans to see lots of detailed prop and costume photos from the Star Trek franchise. 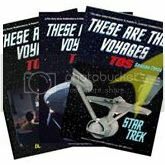 I was hoping the site would be held in high regard and I don't believe there is another with so many different photo-studies of different Star Trek items on the net. With multiple close-up images of individual pieces. I feel fortunate that I have had the opportunity to converse with and befriend many veteran TOS collectors, but I have never pompously proclaimed myself to be some type of ultimate, all-knowing person in the manner that you have suggested. And I'm certain that that is not how my circle of friends and acquaintances regard me. Lastly, in expressing "Best Wishes" to you, I hope to convey that I really do not have any great animosity for you at all. As I've indicated earlier, your logic or lack thereof is quite humorous at times. And I don't believe that your, IMO, hate-filled rants (or "Wrath" - you named this site very well) are received with much respect or credibility by your readers. Notice how your remarks about the recent Sulu costume auction did not prevent it from realizing a record-breaking $27,675 final sales price for that level of screen used recurring cast member costume (someone not a leading star of the series). I really wish that you would be more civil in your discourse - I don't mind exchanging opinions with you or agreeing to disagree about certain props - but all the name-calling and insinuations of misconduct that you make on people is not appropriate, IMO. I will leave it up to the reader to decide who is behaving appropriately and who is not. I realize this squabble is of little interest to many; but I can't help but think that (what is, in my opinion) the reprehensible conduct of an internet bully should not be allowed to go on without response or rebuttal on my part.